In celebration of Pride in NYC and FX's fabulously transgressive new series Pose, we're speaking to the five women at the center of the show—Angelica Ross, Hailie Sahar, MJ Rodriguez, Indya Moore and Dominique Jackson, along with producer Janet Mock—about their experiences making the show. 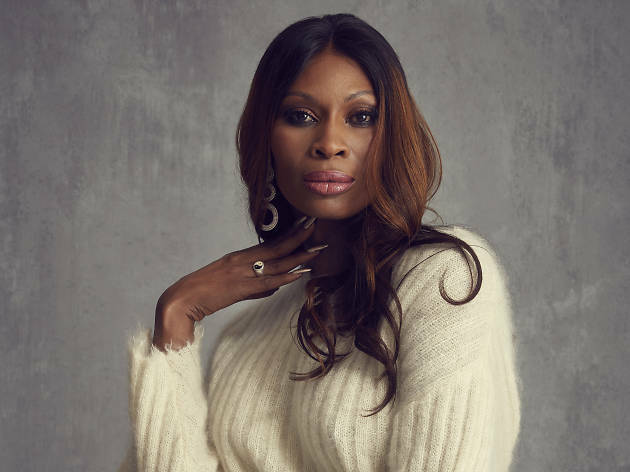 Here's our chat with the divine Dominique Jackson, who plays supreme house mother Elektra Abundance, about her personal history of ballroom and beyond. You starred on the Whoopi Goldberg reality series Strut. What is it like starring on two series that follow the lives of trans performers? Strut was an amazing experience, but it was also a learning experience, because reality TV can be crazy. I feel like I had been blessed to be on Strut, and I returned to working for a trans-founded non-profit called Destination Tomorrow in the Bronx. I started in January of 2017, and by spring I had become the director of programs. I was back in my community and working, and was quite satisfied. I spoke with my friend and my son who were working on Pose, and they told me they wanted me to audition. When I got the script and I read Elektra, I was like: "This is an honor that I can pay to women who have paved the way." People talk about ballroom, but they don’t really understand the history. Crystal Labeija, Avis Pendavis, Paris Dupree, Pepper LaBeija, Dorian Corey. These were the women that really brought ballroom to life. They had to create something that would give the community of color a place to gather and have fun and compete, because we are fabulous, so why not do what we do? Then it went to Octavia St Laurent and Danielle Revlon, women who became like mothers to all of us and taught us. There was always hope that one day we would make it here, to being in this place of being able to work in television, because a lot of us are very artistic and love the entertainment industry, but weren’t given the opportunities to be able to show what we can do. We would walk in and they would say: "Oh great, you’re perfect!" But once they’d hear that you were trans, it would be: "Well, no." You know? Pose has really tapped into some realities that I know would have come from someone who really took time to research ballroom, because some of the lines that I have to deliver as Elektra are lines that mothers of mine said to me. And the dynamic of the family that exists in ballroom is so well represented here; we’re not masking it, we’re giving you the truth. What is it like working on a Ryan Murphy series? Mr. Murphy is really, really amazing. I have admired him from the time that I saw the first season of American Horror Story. I watched Glee, but once I saw American Horror Story, I was like: "I’m working for him." For someone with that type of power to give an opportunity to a community that has been marginalized and misappropriated in so many ways, it is the best example of what it is to give back. And the women we get to portray…these women were fantastic, they were fabulous, they would wear furs to the grocery store. They were women with great poise, who held themselves to the highest of standards even though they were marginalized, so even when they went to ballroom, the way they represented, it was as though you were looking at kings and queens. We revered these women. They were on pedestals to us, despite the fact that they had to work at places like Show World and had to use the fact that people fetishized them in order to survive. What is your personal history with ballroom? I came to be a part of the ballroom scene in late 1993. I was living in Baltimore, and i was going through that phase in high school when no one understood me. I was sneaking out of my house to go to this group that was for gay-identified people, and I just didn’t fit in. I was walking down the street one night, and I was dating this guy, and he was just going to take advantage of me anyway, and these group of kids just walk up to me, and one of them is Shatira Revlon. She’s like: "You’re going to be my child," and the other one says: "You’re my sister and you’re not dating him!" I’m like: "I’m not a girl!" But inside, I was like: "Someone thinks i’m a girl!" And from then we just built this bond. Shatira took care of it for us, and it was eight of us sleeping in this one bedroom apartment, but there was so much love and there was so much family. We did have our squabbles but it was great. I moved on to other houses; I became an Allure, and then from I came to New York City and became a part of the house of Sinclair. When I tell you I have an extensive and vast family, I have about six mothers and four or five fathers, all whom I respect to this day, because there’s a lot they have taught me. Did you worry about your experiences as a trans woman of color being taken advantage of for this show? Of course, that was a concern for me, because that has happened so many times. But Mr. Murphy gave me a feeling of confidence, a feeling of security that made me feel like he really didn’t just want to do something, he wanted to do it right, he wanted to be correct. It’s amazing, because when I walk onto set, I’m seeing hundreds of extras, and each of them was literally from ballroom. And the community of makeup artists who are getting the opportunity to work, and the choreographers. Our community is having the chance to work and become more visible, and I know that this will open doors for everyone. Directors and producers will now see Pose and see us in a different light. That's what it's all about. David Goldberg is the Associate Things to Do Editor Time Out New York. He works every day to be more like Michelle Pfeiffer in Batman Returns. You can follow him on Twitter at @goldberghawn.